1. More Ports, More Convenience - features two USB 3.0 ports, SD and Micro SD card slots, and 4K HDMI video output. The type c male to USB 3.0 female adapter. 2. High Transfer Rate - This HUB supports the maximum bandwidth of 5Gbps, transfer data and stream movies from your external storage devices in seconds, and no drivers are required. 3. HDMI 4k Video Display - Use the HDMI port to output crisp, high-resolution video to your 4k monitor screens. Simply, connect an HDMI cable from Beeasy USB C Hub Adapter to your external monitor to view crystal-clear display. 4. Durable & Compact Design - aluminum alloy case design compliments Apple accessories, it helps dissipate heat better and faster and simple to take the Type-C Hub with you anywhere you go. 5. Easy to use -Plug and play, does not require any software, drivers, or complicated installation process, can support Mac OS 9.1 and above Windows XP/Vista/7/8/10 Linux. 【Instant Expansion with 5 Ports】USB C Hub equipped with 4K HDMI Port, 2 x USB 3.0 Ports, SD & TF Card Reader, It is very compact and fashion design, which expands usb C devides and meets your daily needs. 【Plug and play 】Does not require any software, drivers or complicated installation process. For best connection, please use without a laptop case. Professionally crafted aluminum hub saves your desk space and expands your devices connectivity. 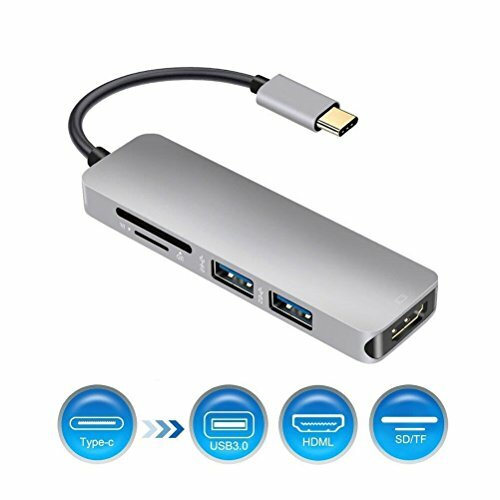 【Two-3.0 USB Ports & SD/TF Card Reader 】Allow you to connect keyboard, mouse, U flash Drive to laptop, and access files from an SD TF card reader, Dual USB 3.0 ports support data transfer rates up to 5Gbps. The 2 USB ports can be connected at the same time. Simply, plug and play to expand your MacBook's capabilities. 【Slim & compact】Unibody aluminum alloy exterior, ionized finish, reinforced TPE cable coating, EMI protection to prevent interfere with wireless devices. The compact and easy-to-use design makes it simple to take the Type-C USB Hub with you anywhere you go. If you have any questions about this product by Raxoon, contact us by completing and submitting the form below. If you are looking for a specif part number, please include it with your message.